NORMAL, Ill. -- After Naperville Central had rallied behind Candace Parker to erase an eight-point deficit and send the Class AA girls basketball championship game against Fenwick into overtime, coach Andy Nussbaum looked at his team. "We've been here before and I know how it ends," Nussbaum said. It ended just the way he imagined. No. 1 Naperville Central and Parker, the 6-foot-3-inch junior who has stamped herself as possibly the best high school player in the nation, answered those who still doubted the Redhawks with a 63-59 overtime victory over No. 2 Fenwick on Saturday night at Redbird Arena. Not only did Central win the school's first state basketball title and finish with a 35-0 record, but Parker broke the state scoring record for a finals weekend. She scored 32 points to finish with 92 for the three-game series and eclipse the old record of 87 set by Molly McDowell of Nokomis in 1998. And Central will go down as the first unbeaten Class AA state champion since 1988, when Maine West also finished 35-0. "It's an amazing feeling," said Parker, who played all 36 minutes and contributed nine rebounds, five assists and three steals in her anticipated duel with Fenwick senior Erin Lawless. "We were rated No. 1 and everyone was still questioning us." People might still have been questioning just how good Naperville Central, ranked seventh in the nation by USA Today, was when the Redhawks were trailing Fenwick (34-3) 37-29 after two straight baskets early in the third quarter. To make matters worse for Nussbaum's team, it then committed a turnover. But what came next, Nussbaum said, is "a great example of perseverance. The kids believed in themselves." One of the believers was freshman Erica Carter, whose three-pointer cut that lead to 37-32 with 6:06 left in the quarter. Then came a Parker basket after a steal by Rachel Crissy and a Crissy three-pointer that tied the game at 37-37. Central would trail again, but the Redhawks were in this game to stay. Even a three-pointer by Fenwick's Nicole Rivera at the buzzer to end the third quarter for a 44-40 lead didn't deter Nussbaum's team. Maybe the Redhawks' most important basket came with 1:42 left in regulation. Parker had the ball just outside the top of the circle, sized up a three-point attempt and went ahead with it. The basket tied the game 53-53 and took Central into overtime. Nussbaum knew what he was talking about when he said he has been there before. In the only three previous meetings between the two schools, all ended in overtime. The last time was in the championship game of the Dundee-Crown Christmas tournament on Dec. 30. Parker's last-second dash beat the buzzer to tie the game in regulation and the Redhawks went on to a 55-48 victory in the extra period. Slightly different script Saturday--same result. Parker's baby jumper with 2:33 left gave Central a 57-55 lead and it never looked back. When Parker fed senior Courtney Peters for a layup with 1:17 left, the Redhawks led 59-55. Parker then hit four free throws down the stretch and Central went into a wild celebration at game's end. Peters finished with nine points and five rebounds and Crissy had two big threes and totaled eight points. Lawless ended her high school career with 22 points and 11 rebounds, but not another championship trophy. 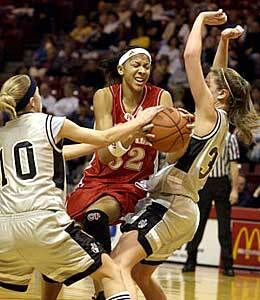 She was a sophomore when the Friars took the 2001 state title. It was a season of overcoming adversity for the 6-2 senior, who is headed for Purdue. She was in tears after the game, thinking of her Uncle Bud--Arthur Lawless--who died before the season began. "He was in my heart the entire time," Lawless said. " But I have to look back on the four fantastic years I had at Fenwick." Elizabeth Marino's 12 points and eight rebounds and Heidloff's three three-pointers on the way to 11 points also aided the Friars' cause. "We didn't come out on top. "But, boy, were we close."